“Orion’s Attic – what a great name for your business,” people tell me and Won-ok Kim all the time. Orion was also the name of the world’s greatest dog. 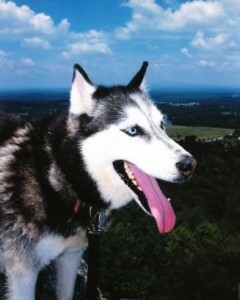 I first met the Siberian husky in the winter of 1997 while writing an article about the Gwinnett County Animal Control Shelter back home in Georgia. Little did I know time that he would change my life. I was 29 at the time and only really beginning to grow from a boy to a man. He was a few years old and had been severely abused by his previous owner. He likely would have been put to sleep if I hadn’t adopted him. I named him Orion, after the constellation I had admired since I was a teenager. There was something celestial about the husky’s spirit and the name just seemed to suit him. He and I looked up at the constellation on winter nights, me thinking deep thoughts and Orion thinking mostly about squirrels. It took me a long time to nurse Orion back to health and even longer to control the abuse-caused epilepsy he suffered from. One bitterly cold, rainy night, when I was too broke to afford to take him to an emergency medical clinic and get him a shot that would help him go to sleep and ease the seizure activity, I had to tackle him and pin him to the cement carport. The vets told me if I could keep him still and relaxed, it could help break the cycle. I remember finding blankets for him and holding him until he fell asleep … while the cold and cement sent pains shooting through my own limbs until sunrise. I remember thinking that was the first time I had truly understood what it meant to put another being’s needs before my own … to be committed to the happiness and well-being of another. That was just the first of many lessons Orion taught me. I gained a lot more knowledge in the decade we spent together. I learned more about how to treat people from him than I did anyone else in my life except my parents. He had a gift for seeing all people without bias or fear. He would encounter a person suffering from elephant man syndrome and treat him like he was the most beautiful man in the world. At assisted living centers, Orion was the only living being who somehow communicated with residents straddled with dementia. Their eyes lit up like stars when he came around. There wasn’t a man, woman or child whose face he couldn’t put a smile on. Naturally, I became putty in his paws. I sobbed for weeks when he died and still miss him terribly. 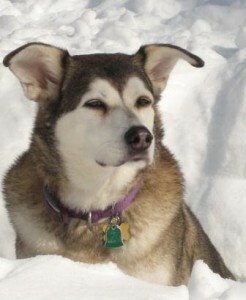 (His adopted sister, a shelter-rescued half-husky named Alexis, is still with us – serving as our official spokesdog.) In the classic movie It’s a Wonderful Life, George Bailey learns that an angel gets its wings every time a bell rings. I’d like to believe canines earn such honors, too. That’s why Orion’s Attic makes a charitable donation to a worthy cause every time the cash register rings. The philanthropy is even more rewarding in the winter when Won-ok and I can look up at the stars, see the constellation and wink at the spirit of the world’s greatest dog.